The employment of one fluorite and one HRI lens elements as well as magnesium-alloy parts makes the lens lighter than the former model, supporting photographers by reducing their fatigue, allowing them to maintain their concentration even in difficult situations on location at professional shoots. Movable parts and other sections are sealed to enhance anti-dust and drip-resistant capabilities, enabling photographers to continue shooting even under unpredictable conditions, while fluorine coat, applied to the extreme front lens surface, delivers high antifouling performance for easy maintenance. 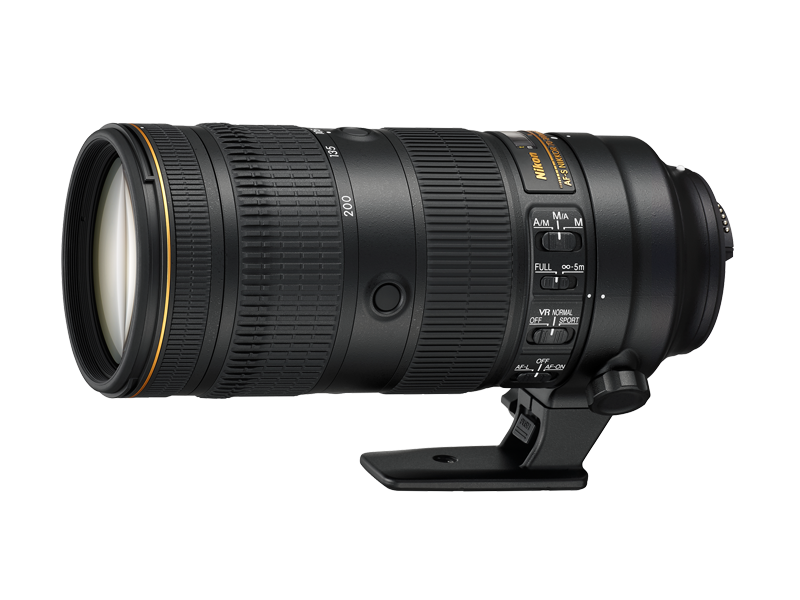 The weather-resistant performance combined with the reduced weight makes this lens highly agile equipment that supports shooting in diverse environments. Further enhanced optical performance is realized with a newly developed optical system, providing higher-resolution images even in the peripheral areas of the frame throughout the entire zoom range. Superior optical performance is also achieved by utilizing one fluorite, six ED glass and one HRI lens elements that effectively reduce various aberrations, and lens elements with Nano Crystal Coat for minimal ghost and flare. SPORT mode, employed as an option of the Vibration Reduction (VR) system, is especially effective when taking pictures of scenes in which subjects are radically moving, providing a stable viewfinder image even when tracking randomly moving subjects during high-speed continuous shooting handheld. VR performance immediately after the power-on has been improved with the VR function activated by half-pressing of the shutter-release button right after the power is turned on, instantly enabling a stable viewfinder image and fine resulting images with maximized blur-reduction effect. The VR system offers an effect equivalent to a shutter speed 4.0 stops* faster in NORMAL mode. * Based on CIPA Standard; when attached to an FX-format digital SLR camera, with zoom set at the maximum telephoto position. With the employment of the newly developed algorithm, barrel vibration transmitted to the hands and sound when the AF drive starts/stops are remarkably reduced, while AF tracking performance for continuous shooting of subjects with unpredictable movement is improved. Even during high-speed continuous shooting, stable AE control is achieved with the adoption of an electromagnetic diaphragm mechanism. Shorter minimum focus distance and increased maximum reproduction ratio allow photographers to get much closer to subjects, attaining photographic expression similar to close-up shooting. The zoom ring, that is more frequently used than the focus ring, has been relocated to the front side, ensuring well-balanced, comfortable holding during shooting. Four focus function buttons, newly employed for this lens, are positioned at the top, bottom, left and right at 90° intervals, making it possible to press any of them in diverse lens holding situations regardless of the camera orientation. Using the custom menu of the D5/D500/D4S/D810/D810A, functions enabled with a press of the focus function buttons can be changed (when focus function selector is set to AF-L).